The arms of the Weeks Rocker fit your arms--in profile, in pitch, and in relief. They are hard to make. We select and mark the rocking chair arms in pairs (with their back legs) for matching figure, color, and character. Note the symmetry of the end grain in the pairs. This will translate into coherence in the chair. You can see it. You can put your hands on it. We develop the parts to accurate thickness, width, and length--to simple, rectilinear solids that will end up neither simple nor rectilinear. The accurate thickness, width, and length give us known planes on which to index the development of the complex shape. We cut tenons on the arms. See Mortise and Tenon. With patterns, we draw the profiles. 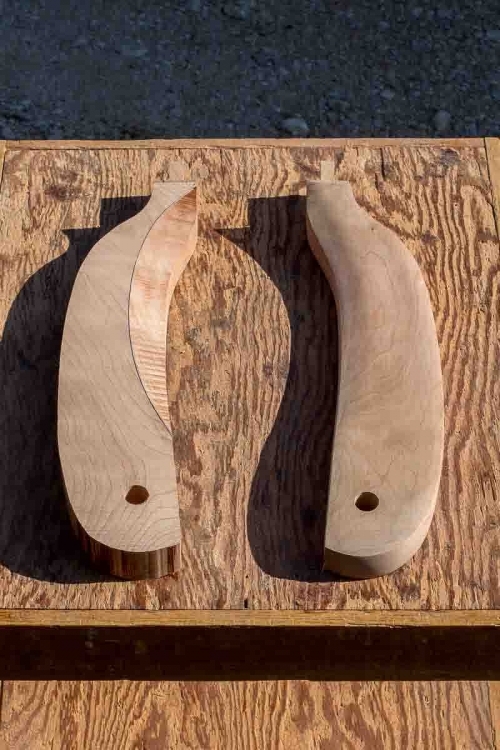 We cut on the line with the bandsaw--the more free-flowing, and faultless the cutting, the less labor the sanding. At the chair back sander we remove the bandsaw marks and true the curves. Skill at the bandsaw saves lots of time here. At the pump sander we sculpt and soften the surface.